By default, iTunes is the only media player that you can use to sync your iPhone and iPod Touch with your computer. However, iTunes is only supported in Mac and Windows, which means Linux users with iPhones will have to find an alternative way to sync their iPhones, or at least get their music into the mobile device. In addition, there may be a large group of Windows users who are using other media players (such as Winamp) to manage their music library and loathe the idea of migrating the whole library to iTunes just because they bought an iPhone. In this article, I will point out 6 other ways that you can transfer music to your iPhone without iTunes. MediaMonkey is a heavy-duty, fully-featured media player for Windows. It is just like iTunes in Mac, allowing you to manage your music, video, podcast, rip CD, organize album art etc. In their latest version 3 release, they implemented iPhone/iPod Touch support and you can now transfer/sync your music easily. In order to use Media Monkey to manage your iPhone music, you have to first install iTunes (version 8.1.0.52 and before). That could be ironical since the purpose of it all is to do without iTunes completely. However, iTunes comes with the device driver for iPhone/iPod Touch that is required by many third-party media players to detect and access the database of the iPhone. 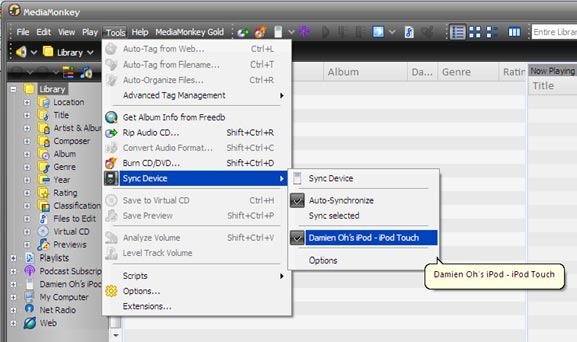 As soon as you install iTunes, you will be able to use Media Monkey to sync your music. You can then sync your iPhone with Media Monkey without iTunes. 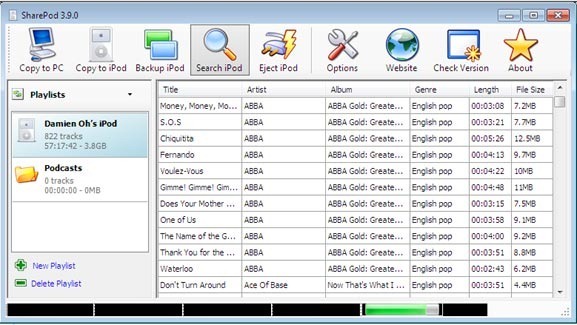 For those who have been using Winamp since the first day it was launched, there is no need to migrate all your music library to iTunes just because you bought a iPhone. 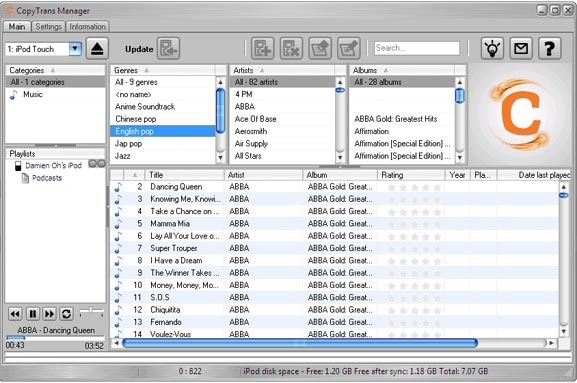 With the ml_ipod plugin, you will be able to sync your music. Firstly, you have to install iTunes (ml_ipod was tested with iTunes 7.4.2 and 8.0.2. If you are using a later version of iTunes, might not work), or use the above hack to install the driver without installing iTunes. 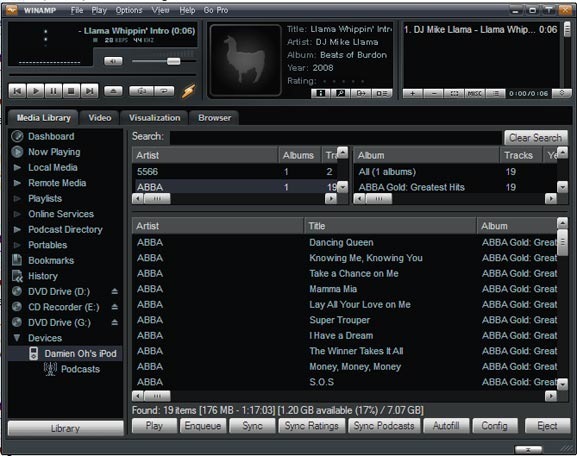 Secondly, install Winamp (recommended version 5 and above), follow by ml_ipod (version 3.08 or later). Plug in your iPhone and start Winamp. You should be able to see the device appear on the left side of the panel (see above screenshot). One good thing about using this combination is, unlike iTunes, this is a bidirectional sync - you can download the songs back to your computer. If you are looking for a simple and lightweight software to get the synchronization done quickly and easily, then Sharepod would be a good choice. Sharepod is nothing more than a software for you to sync your iPod and iPhone. While you can play music directly from your iPhone within Sharepod, the music player is only minimal and does not offer much options. SharePod also offers bidirectional synchronization between your iPhone and computer. Did I also mention that there is no installation required for Sharepod? It just works! Just like the above two softwares, you’ll need to install iTunes (or perform the hack) for SharePod to recognize your iPhone. 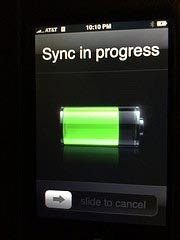 If you are still using firmware 1.x on your iPhone, CopyTrans Manager will work out of the box to sync your iPhone. However, if you are using firmware 2.x, it will prompt you to apply a fix to downgrade the iPhone database so that it can be read by the software. If you are not comfortable with it modifying the internal structure of your iPhone, this software might not be for you. Editor’s note: Downgrading your iPhone firmware may render your iPhone incapable of using newer applications which require firmwares 2.2 and higher. Unlike all other software listed above, you don’t need to install iTunes to use CopyTrans Manager. It claims to be the alternative to iTunes. Perhaps in the field of syncing your music library, it can be a good alternative. Other than that, it is clearly lacking in features and does not offer as many features as iTunes. 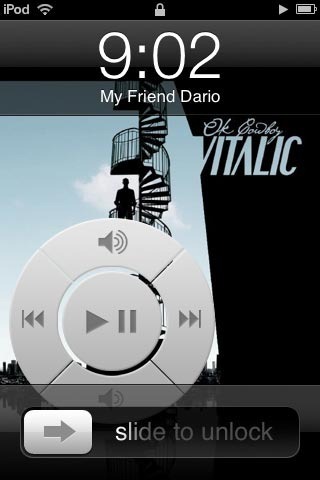 Pwnplayer is an iPhone music player app that acts as an alternative to the default ipod.app in your iPhone. 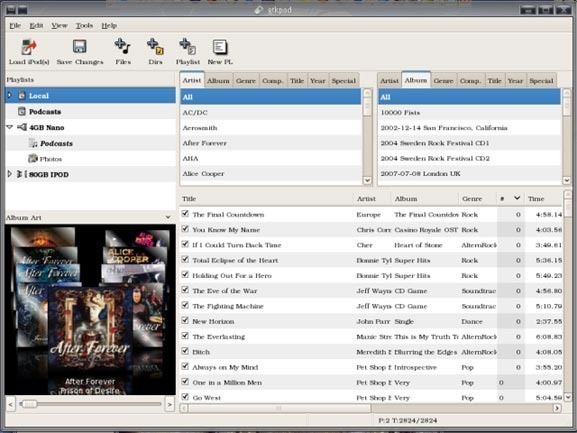 Its user interface is almost similar to the iPod.app, allowing you to view your songs in Artists, Albums, Songs, Genre list etc. It also supports album art display. To use Pwnplayer, you have to first jailbreak your iPhone, then install the PwnPlayer application from Cydia. Once you have jailbroken your iPhone, you can then transfer your songs (over SSH) to any folder in your iPhone (for more information about transferring files over to the iPhone, refer to my older article: 6 Ways To Use iPhone As An External Hard Drive). Pwnplayer will scan the whole iPhone hard disk and add the songs to its library. You don’t have to worry about any compatibility with OS platform since it works regardless which OS you are using. As long as you can perform SSH in your computer, you can get Pwnplayer to work. For those who are geeky and advantageous enough, here are the full instructions to hack your iPhone to get it to sync in Linux with gtkpod. Enjoyed this article? Maybe you’ll be interested to know that you may also sync any MP3 player with iTunes. Also, find out how you can easily make ringtones for your iPhone. What other ways do you use to sync your music to iPhone without iTunes? Let us know in the comments.